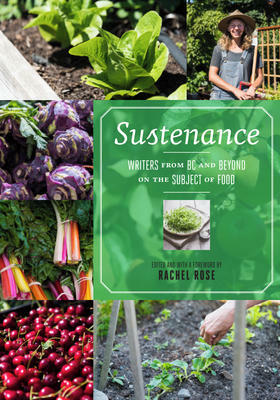 With its over 250 prose and poetry narratives, biographies, and recipes, Rachel Rose has edited a timeless anthology, Sustenance: Writers from BC and Beyond on the Subject of Food. Rose, named Vancouver’s poet laureate in 2014, wanted to produce during her tenure a book such as Sustenance,to “…engage those outside of the poetry community as much as those within it” (p. 13). To complete the project, she enlisted colleagues – gifted poets and teachers – to interact with people in Vancouver and elsewhere, to find the poetry and other narrative treasures that appear in the book. Rose and colleagues were successful in finding a diverse array of authors – unpublished writers, grade-school students, well-known chefs, instructors and professors, émigré prize-winning essayists, grade-school teachers, college students, residential school survivors, writing fellows, and arts activists. Rose envisioned the project as a contributor to social change – via its educational value, but also its financial significance. Contributors donated their honoraria to the BC Farmers Market Nutrition Coupon Program, which provides vouchers to low-income and refugee families in the province to procure local fresh produce. The topics in the book are wildly varied – cooking in refugee kitchens, heating a pan of oysters, preparing mushy peas and carrots or chicken-foot soup, making golden sauces with honey and almonds, mixing slabs of crumbling cheese, fermenting fruit, stewing fava beans, cutting rockfish, enjoying sea-lion stew – as Rose wanted to build diverse tables, not walls so as to “…sit eye to eye in the sacred relationship of guest and host, mutually obliged and interdependent” (p. 13). …Blend the mixture either in a machine that is not to be found in Canada, or with the hands. Cook the meat separately, though in Aleppo we eat it raw. Do you have any Canadian friends yet? I ask, and you both shake your heads. Rose, however, is cooking up more than food with this anthology. She acknowledges, “Words of pain and hope from within our fractured literary community sing on these pages, as we collectively struggle to find a way through our own complicated inheritances” (p. 13). Rose recognizes that she (and many of the contributors) lives and works in unceded homelands of First Nations people. Further, part of the motivation for the project comes from her profound experiences supporting refugee families. In Sustenance, Rose has succeeded in compiling the authors’ emotion-stirring prose around refugee themes, as with Terrie Hamazaki’s “Eggs” (pp. 111-112) or Claire Sicherman’s profound “Fragments” (p. 114), which describe her grandparents’ concentration camp experiences in vitally-important food bartering. Sustenanceis a must-have book for any teacher, student, poet, or consumer of food. If, in fact, “food, art, and kindness can change the world,” as one writer (A.L. Carlson) writes in her bio (p. 57), then, Sustenanceshould do much to advance such change. 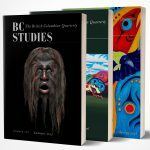 Vancouver, BC: Anvil Press, 2017. 256 pp. $25.00 paper.